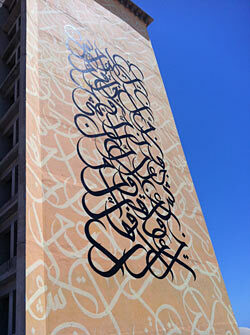 eL Seed, a French-born Tunisian artist, painted Arabic graffiti on Tunisia’s tallest minaret. 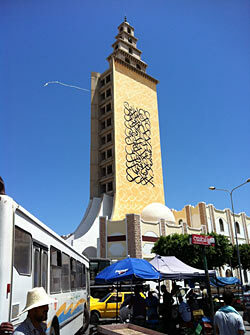 Inspired by the recent debate between religious sects and the art community, this artwork - the largest graffiti mural in the country - is located at the Jara Mosque in Gabès, viewable for the holy month of Ramadan. The artist believes that “art can bring about fruitful debate” and that art can help with “the process of cultural and political change.” The artist began the mural on July 20, 57 meters in the air.